Conor Cleary is leading the Clare charge in Thursday’s Bord Gáis Energy Munster U21 hurling final. Clare U21 hurling captain Conor Cleary. CLARE’S 1995 and 1997 All-Ireland winning centre back Seanie McMahon was an icon for Conor Cleary when he was growing up. Since he was “five or six years old”, Cleary wanted to be just like McMahon and so far, he’s heading very much in the right direction. Cleary claimed a Bord Gáis Energy All-Ireland U21 medal last year, having broken onto the panel in 2013 as an unused sub. And history was made earlier month when Cleary became the first Miltown Malbay man in history to captain a Clare U21 hurling championship team. 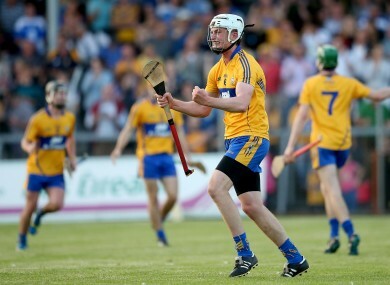 The current Clare senior panellist plays his club hurling with Kilmaley and tomorrow evening at a packed Cusack Park, the towering centre back hopes to inspire the Banner County to a fourth successive Bord Gáis Energy Munster U21 crown. Clare, managed by Donal Moloney, sent out a massive statement of intent with a gritty semi-final victory over star-studded Waterford, viewed by many before the game as favourites for the All-Ireland title. And in a coaching role alongside Moloney, St Joseph’s Doora-Barefield man McMahon is playing his part ahead of the clash with Limerick in Ennis. Cleary smiled: “He’s serious, he was a hero of mine growing up, I wanted to be Seanie McMahon since I was five or six years old. “To see how down to earth he is, it’s just like chatting to anyone but to see what he’s done, it’s crazy. “He’s a very nice fella and great to have him on board. “He works all over the field, he’s marked very good forwards and played in defence. He knows both sides of the coin. Victory over Waterford has fuelled hope that Clare can claim provincial silverware again before aiming for a fourth successive All-Ireland crown – but Cleary is eager to dampen down expectations. He said: “A lot us wouldn’t read papers, wouldn’t be on social media or listening to what anybody would be saying. “I’m on Twitter but I just keep to the soccer things. I wouldn’t be clicking into articles about Clare hurling or anything! He added: “To the wider public it probably wasn’t expected but in any game you go into, you probably have to believe that you’re going to win it. “Against Waterford we did believe that we were going to win. “We know that on Thursday night we’re going to have to work harder than the last time. “It was a great win but at the same time, we know it was only a semi-final. Thursday is the night you play for silverware. “They (Waterford) were the favourites at the time but there’s nothing won. It was a step along the road but it was our focus all year. “We didn’t look past the Munster semi-final, everything we talked about was Waterford. “Unless you actually win a title, that’s when a team is recognised. Hailing from the football hotbed of West Clare, Cleary explains that it was his parents who helped to foster his interest in both codes. He said: “My mother and father always pushed myself and my brother Eoin to play both sports and it wasn’t just football. “I remember when I was watching hurling games when I was younger, they’d say ‘we’ll bring you over to Kilmaley’ and they did for a finish. “Eoin stuck with the football but I kept up the hurling because going to St Flannan’s too was a big thing. At St Flannan’s, Cleary captained the football team but he also hurled alongside current Clare stars Tony Kelly, Jack Browne and Peter Duggan. Email “From West Clare football country and becoming the new Seanie McMahon”. Feedback on “From West Clare football country and becoming the new Seanie McMahon”.